K: Where did this line come from? N: When Mikiko was imagining it, she thought of Ichiro’s “laser beam” accuracy when making a throw to home. So there’s a feeling to this song like throwing a ball. Tanaka [Yasutaka] also thought of Ichiro, and he’s the one that wrote this line, wasn’t he? A-chan: We don’t know that Tanaka likes baseball. (laugh) If you don’t know about Ichiro, then these lyrics are some kind of miracle. If you know about him, though, it seems thought out. K: We haven’t asked if he likes baseball, though. --(laugh) The piano in “Kasuka na Kaori” is very fresh. N: You don’t really get that feeling on singles. --There are a lot of touching lyrics, like “Mail ni sugu ki ga tsuku you ni / Keitai nigiri shimete neru kuse tsuita yo” [“I fall asleep grasping my cell phone tight / Awaiting the moment your email arrives”]. A: I’m always falling asleep holding onto my cell phone. N: Are you still holding it when you wake up? K: Oh my gosh! You hold it for all 6 hours? K: What?! Don’t you turn in your sleep!? K: (laugh) The picture on the jacket of the Regular Edition is an image of this song. It was taken on the roof of a building. A: That’s Odaiba [a district in Tokyo] behind us. It was freezing. N: And we were just wearing thin cotton. A: But it’s such a peaceful picture. It looks really natural. K: After the sun went down, we didn’t have anything to do but go to a festival, which was unusual. We did 2 types of covers for this single, and I thought we were really showing off the breadth of our style with it. --The fans also like the breadth you show. When you think about Perfume’s awesome singing and dancing, you also think of the innocent girls who have just started doing MCs in their shows. A: That’s Perfume in a nutshell. (laugh) There’s of course the thought that we’re “chatter and worldview deconstructed” but we don’t think about it that hard. We think of what we want to say with a song, how to convey it easily, and what we want to share with everyone. That’ll never change. --This is the first single you’ve released this year, and it’s a good start. A: Last year Tokyo Dome marked our big achievement, so this year we don’t just want to do a live, we want to try a lot of different things. And the courage to take the next steps has welled up in us. We want to be better for everyone. 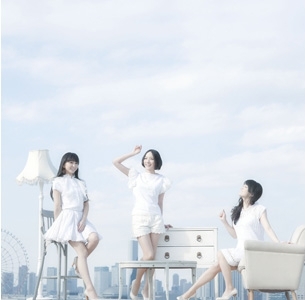 --By the way... Kashiyuka, I noticed that you parted your hair in the “Laser Beam” jacket picture. Is there any reason you did your hair like that?